After waking up in Puno much more refreshed after a good 12 hour sleep, it was time to head over the border into Bolivia. Transport options are rather limited, so after a bit of research on the internet I booked a tourist coach with the Bolivia Hop. I must point out that I’m complete coach novice, especially in a foreign country, so was actually very pleasantly surprised with both the value and the service from the staff there. I was given a 30 minute time window to be picked up from the reception of my hotel by the bus company. Sure enough, bang on time, one of the representatives walked in to the lobby, taking myself and two other guests to the waiting minibus. My fellow travellers were a rather portly, rather loud, Australian guy in his mid 50s complete with a baseball cap saying “Beer Police” and what I believed to be his rather camp, Thai husband (or significant other). I didn’t get chatting save other than a “good morning”. The minibus took us via a couple of other hotels to pick up other guests to the waiting coach at the edge of town. There were already about twenty people on board who had travelled overnight from Cusco. I ended up sitting next to a very cute Brazilian petroleum engineer called Caio for the journey and we chatted for about half of the trip to the border. The company promises that every bus has an English speaking guide and he came around with details of some of the tours that were available once we got to Copacabana. He also explained what would happen with the immigration formalities at the border and handed everyone the requisite forms to fill in, both for exiting Peru and entering Bolivia. A couple of hours later we got to the border and everyone disembarked, grabbing their backpacks, save for the two Chinese ladies with their gigantic Rimowa suitcases. We first had to exit Peru before we would be allowed to enter Bolivia. However it appeared that the Peruvian IT systems had failed so there was a queue of about 40 people out of the door of the Police office. After waiting around for about twenty minutes, some kind of system was cobbled together. The bus company guide took our passports and photocopied them with our entry stamps which were then given to the immigration authorities – without him being so helpful I’m sure the hanging around would have lasted a lot longer. We then walked over the border, through the arch on the border, and then through to the Bolivian immigration office. Officially, you must have a yellow fever vaccination and your certificate to enter the country, however the officials clearly didn’t care about seeing it. After everyone on the bus was processed, we then boarded another bus for the fifteen minute journey over to the Copacabana. Copacabana is not a pretty town. The view is pretty stunning, but the town itself is quite frankly a dump. It’s very much a backpacker town with not much to redeem it. However the hostel that we stayed at was incredible. 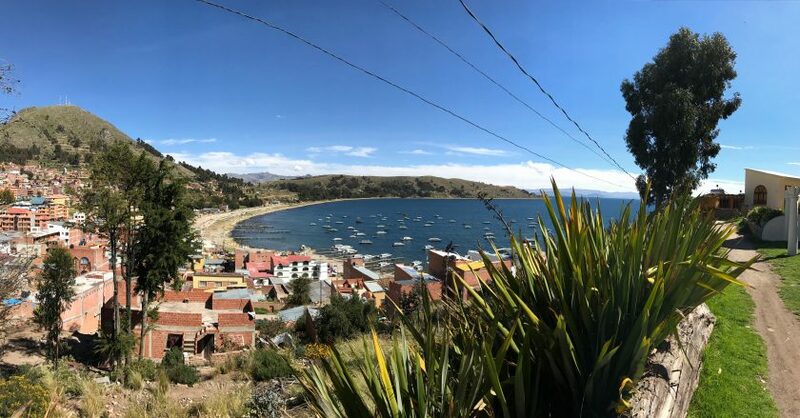 La Cupula was perched on the side of the hill, overlooking the town with views over the town and Lake Titicaca. We had a private room with en suite shower, complete with views from bed over the garden and the town. The hostel also had a hot tub that was bookable in hour slots. We managed to secure 22.00 to 23.00 on a gin-clear night. The town is around 3,900m above sea level so the views of the stars with almost zero light pollution are something that will stay with me for a very long time. There’s also a full restaurant serving local cuisine. The bill for the room, a three course dinner, with drinks came to less than $80. Definitely the best value night on my entire trip and would go back to the hotel in a heartbeat. 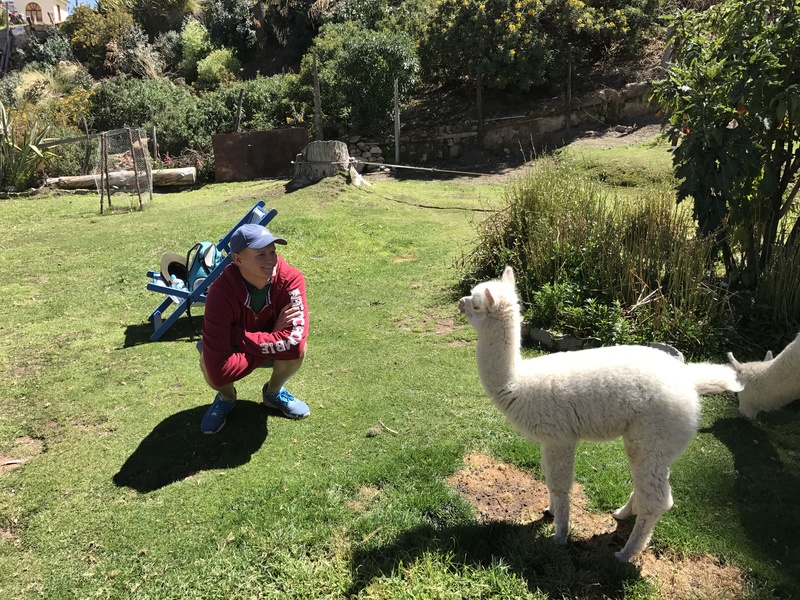 They even had some Alpacas in the garden which my friend J-P was fascinated with! The next morning we checked out and boarded one of the tourist boats to take us over to Isla del Sol. But more of that in another post. Previous Post: Cusco to Puno. The Andean Explorer. Next Post: New York for under £1,000 in business.